4/9/12 - Acquisition - Warsaw, Museum of the Royal Palace - The Foundation of the Royal Palace Museum in Warsaw recently purchased a portrait of Count Jan Potocki, by the German painter Anton Graff (ill.) on the French art market from F. Baulme Fine Arts. The model, born in Poland of a noble and very wealthy family, was educated in Geneva and Lausanne, Switzerland. A veritable spirit of the Enlightenment, he traveled extensively throughout Europe, Northern Africa and Asia, spending long periods in France where he met the encyclopediasts and frequented the royal court. During the French revolution, he was granted permission to attend the debates at the Assemblée Nationale. 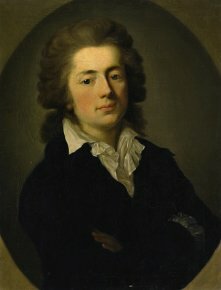 Count Potocki is mostly known today for his writings, entirely in French, notably many travel accounts. However, his most popular work, The Manuscript Found in Saragossa, a fantastic novel, was published in French at a later date. Truly European in every sense of the word, he nonetheless maintained strong ties to his native country and was elected deputy to the Warsaw Diet, at which time he was often seen at the royal palace and consulted the library there. A Swiss artist who spent his career at the Dresden court, Anton Graff specialized in portrait paintings. The portrait of Jan Potocki acquired by the Palace in Warsaw resided for many years at the Lancut family palace in Poland where it was attributed to Elisabeth Vigée-Lebrun. This attribution is easily understandable as this work, often the case with Graff, was very influenced by French art. It was sent to Switzerland in 1944 along with the rest of the collection, much of which was sold at auction in the 1950’s. Graff painted this portrait in 1785 in Karlsbad, as well as those of other Potocki family members. That of Stanislaw Kostka Potocki, Jan’s brother-in-law and cousin, remained at the Wilanow Palace in Warsaw. This new acquisition will hang in the Yellow Salon at the royal palace, in the apartment of the last Polish king, Stanislaw August Poniatowski.